July | 2014 | Poverty, Agony, Distress & Want! My dad told me it would happen at some point in my life. He even guaranteed it. At the time I refused to believe it was possible; I probably told him he was making it up. Why? Most likely it was because I did not know any better. Oh the foolishness of youth! My dad is probably watching me right now and laughing. If he were here he’d tell me I told you so. Karma right? Totally one hundred percent! If you’re looking for the answer to that cryptic series of sentences, you’ll have to keep reading. In the meantime, let’s get up to speed shall we? So we’ve arrived at the midway point of July; wow, that was fast! Time flies when you’re having fun right? The last time I posted was the end of June and I was getting ready for the end of school. A lot has happened in that time. The football trip to Duluth was great, and the team certainly enjoyed themselves. It was also a good time for the coaches, though it was hard to get my brain into football mode at this time of the year. Hopefully we’ll have a chance to go back next year. Yesterday we arrived home from a fourteen-day trip to Toronto. My wife was taking an AP math course there and the boys and I headed down on the 2nd. It was an interesting road trip to since I had never taken the boys that far by myself. It went well though, and we eventually met up with mom on the 4th. 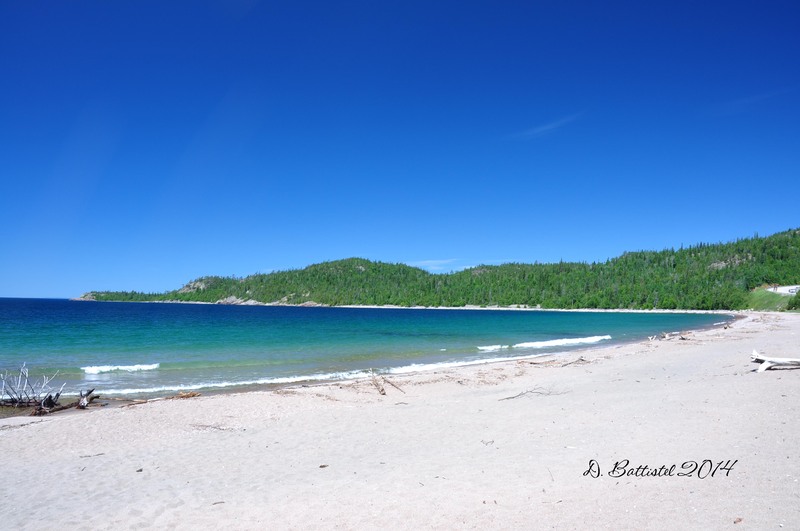 Old Woman Bay, Lake Superior, July 2014. Our first weekend was taken up by two trips down to Hamilton and the Niagara region. 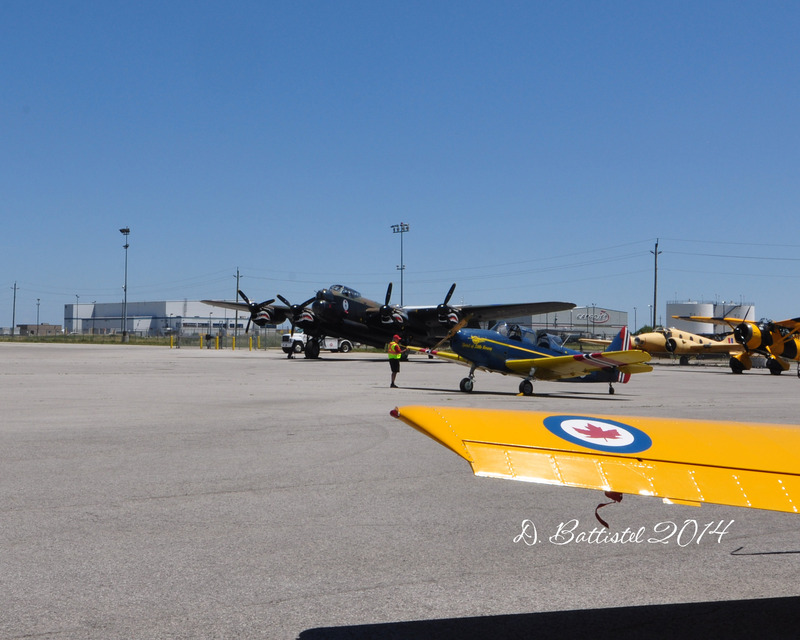 On Saturday we visited the Canadian Warplane Heritage Museum, located at the Hamilton airport. We were supposed to go there on last year’s trip, but it was closed due to a freak storm that caused damage to the facility. By fluke the museum had a special visitor, which was a B-17 Flying Fortress “Sentimental Journey” from the Commemorative Air Force Museum in Arizona. For $5 we got to tour the plane, which really made you appreciate the challenges the crew faced manning the plane. We did not see it take off, but the Mynarski Memorial Lancaster was waiting on the tarmac sporting its special D-Day anniversary markings. 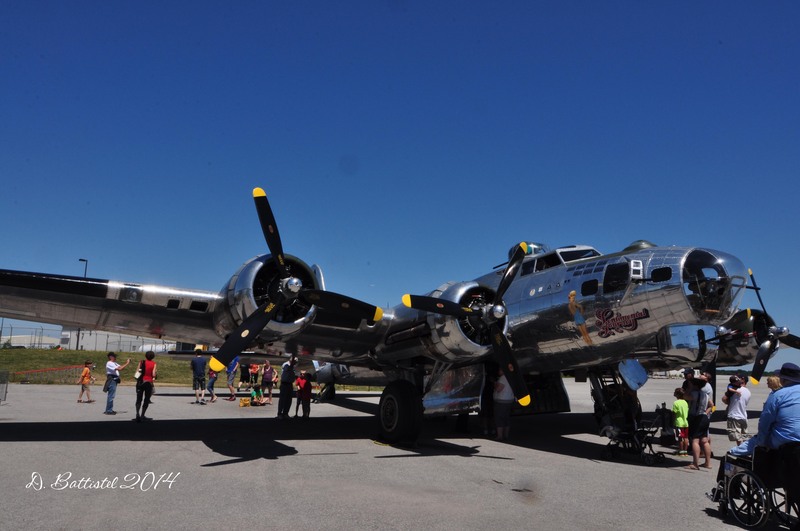 B-17 “Sentimental Journey,” July 2014. Mynarski Memorial Lancaster, July 2014. Sunday we were back in Niagara, this time very close to the falls. After dropping my wife and my brother’s girlfriend off at the outlet mall, the boys, my brother and I headed to the Battle of Chippawa Historic Site. 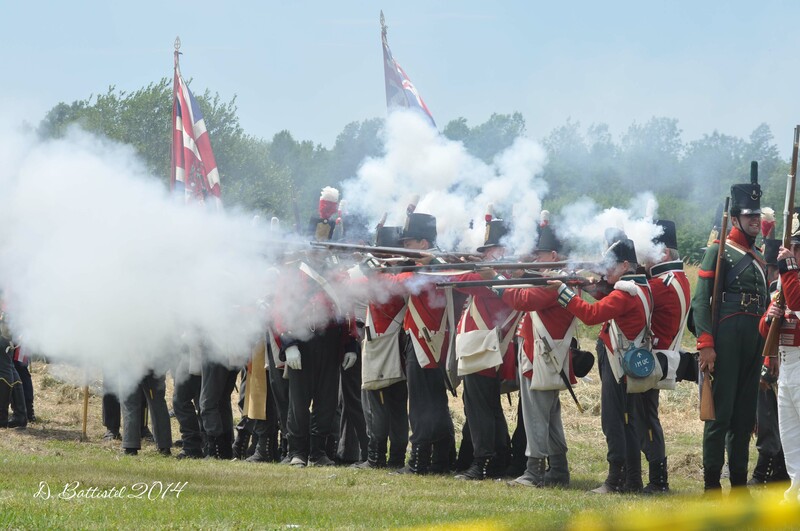 To celebrate the 200th anniversary of the Battles of Chippawa and Lundy’s Lane from the War of 1812, the park would be hosting a re-enactment of Chippawa on July 5th, and then a re-enactment of Lundy’s Lane on the 6th (which really happened on July 25th). Entering the site you were greeted by various historical vendors, which was rather neat to see. Passing the “gates,” there were rows and rows of tents of the re-enactors and their families. It was fascinating to see so many people dressed in historical attire, though watching them eat potato chips and drink bottled water did solicit a bit of a chuckle on my part. The festivities began with an artillery demonstration by the six cannons that would be taking part in the re-enactment and then followed by a performance by The Drums Crown Forces 1812 band. The Battle of Lundy’s Lane was one of the bloodiest battles of the War of 1812, and most likely the bloodiest battle ever fought on Canadian soil. The re-enactment was fantastic; the volleys of musket fire, booms of the artillery and the blinding smoke really gave you a sense of what an early nineteenth century battlefield was like. I’ve already made one video of the event with more in the works. 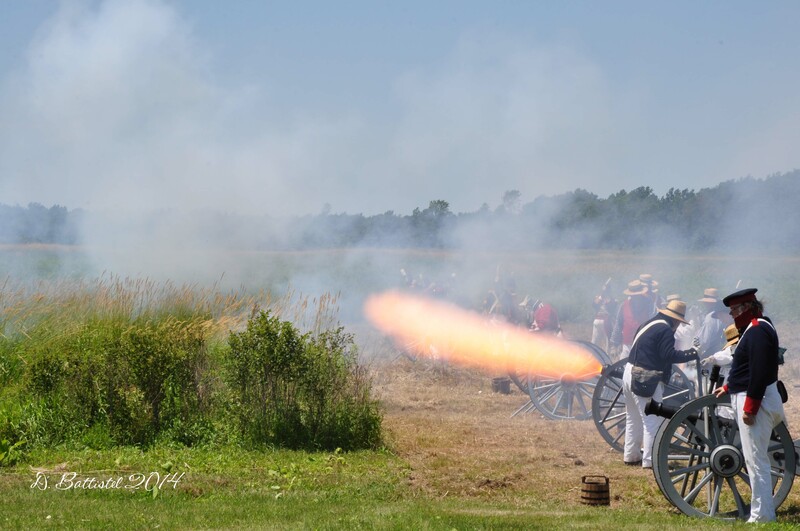 Artillery demonstration, Battle of Lundy’s Lane, July 2014. 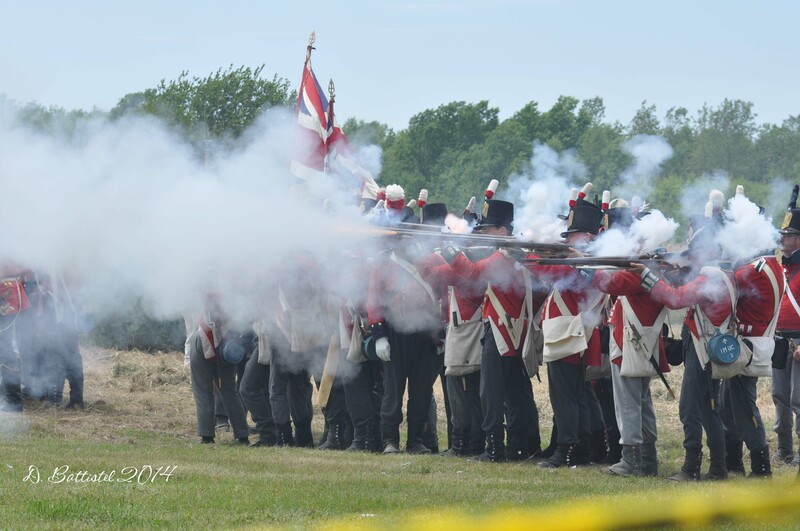 Battle of Lundy’s Lane, July 2014. Monday the 7th was a rainy day in Toronto, which was the perfect weather for what I had in store for the day. I had decided a long time ago that if we did this trip, I wanted to pay a visit to the Archives of Ontario, which are now located on the campus of York University. It was a short bus ride from my brother’s house to the Archives (due to new subway construction on Keele Street, I walked from Finch Avenue to the Archives). Back in 1999 I made my first to the Archives to examine a very important file associated with the sale of the railway. I had made some notes from this legal suite that went to the High Court of Ontario, but I felt that I needed to go over it again to find more specific details. It’s funny on how our perceptions can change over time and when I opened the file it seemed to me that it was much larger than I remember. Since I’m not a lawyer, and obviously there is a lot of legal stuff in the file that I don’t quite understand, I ended up photographing the whole thing with my iPad so I could go over it later. It probably saved me a lot of time, but it still took me almost 3 hours to go through the whole thing and left me with some very sore shoulders! Another highlight from the trip was the celebration of Noah’s 7th birthday. After looking at a number of venues, we settled on a trip to the Medieval Times Dinner and Tournament. Other than my brother, none of us had ever been there, but I had heard a lot of good things about it. It was pretty cool from start to finish. We were seated in one of the front rows of the blue section, and in between some great performances we enjoyed the very “medieval” meal served to us on pewter bowls and plates; the soup, chicken, ribs, potato, bread and dessert were all consumed without the aid of any utensils. Our knight was not champion on the evening, but I would definitely go back again. When we travelled to Toronto last year, Noah had unfortunately broken his left arm only a few weeks before the trip. This left him unable to really enjoy one of the great attractions of Toronto, which is Canada’s Wonderland. It would be different this time around, which brings me to the title of today’s post. You see, my oldest son Ethan has evolved into quite the thrill-seeker. He decided, much to my chagrin, that he wanted to do all the crazy coasters at the park (Noah isn’t quite tall enough yet). The problem is that his dad isn’t very good with heights and I have never been a really been a fan of these crazy rides. But, like any good dad would do, I choked back my fears and jumped in with both feet. So other than the trip to the Archives, things on the railway front have been quiet, having been in Toronto and all. However, that is about to change very soon. 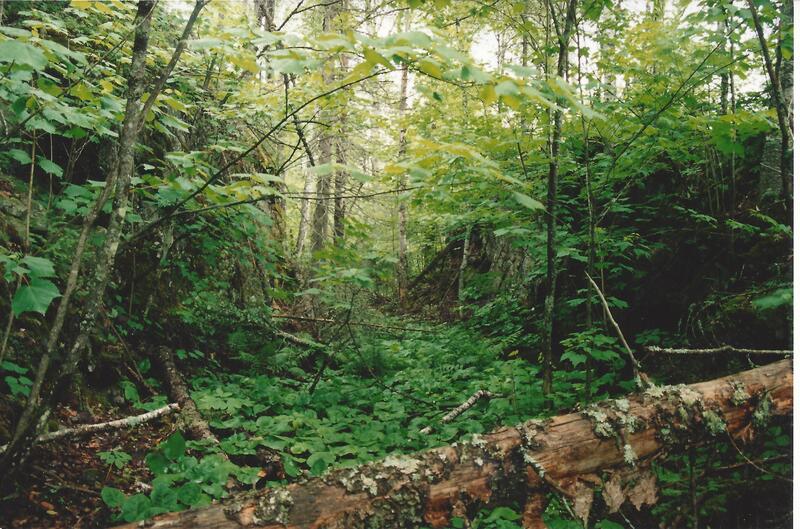 On Sunday I will be giving my first lecture of the year at the Chik-Wauk Museum at the end of the Gunflint Trail. My first presentation there in 2012 was very successful so they have asked to me return and speak again on the front porch of the museum. This time my emphasis will be more on the Paulson Mine end of things, which means I have a bit of work to do to modify my usual lecture to be ready. I’m planning on spending a few days on Gunflint Lake after Sunday; if the weather cooperates I’ll be doing some field work in the area. 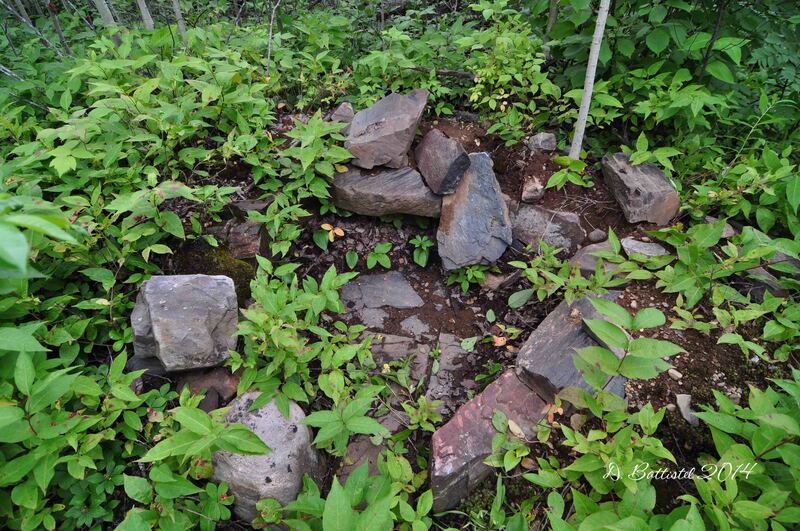 I did have to modify my plans somewhat, since the bush is still a little wet from all the rain we had in the spring. 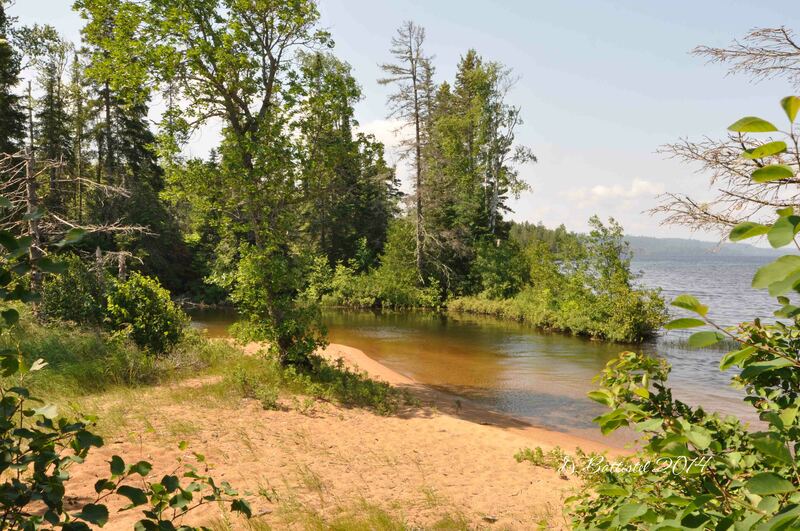 I’ll be focussing my attention on the Gunflint and Lake Superior Railroad, which was a small logging line that branched off the PAD&W at Little Gunflint Lake and ran about 4 miles into Minnesota. It was owned by the Pigeon River Lumber Company and operated from 1903 to 1909. This visit is actually some preliminary work for a trip I have planned for Thanksgiving weekend in October when the leaves are down and it is easier to see things. 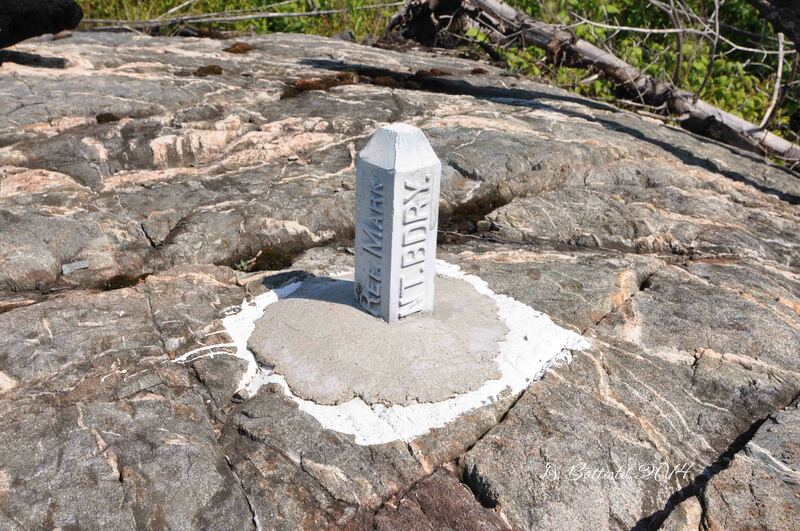 So this visit to Minnesota reminds me of my trip to hike there in 1998. Since it’s been twenty years of work on the railway, it seems appropriate to take another stroll down memory lane. At the time I was not yet 25 years old and had just completed my first year of supply teaching. I would be heading down at the end of June, since it was the only time I could fit it into the schedule of my other part-time job. Since money was tight and I couldn’t afford a lot of extravagances, my accommodations for the trip were my small tent and a camp site at the Gunflint Pines Resort. 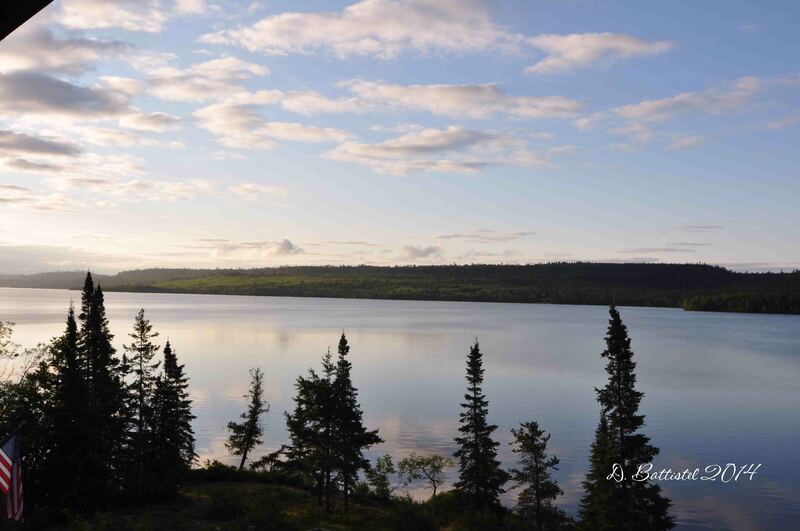 After stopping for some provisions in Grand Marais, I headed up the Gunflint Trail for the first time ever and made my way to Gunflint Lake. 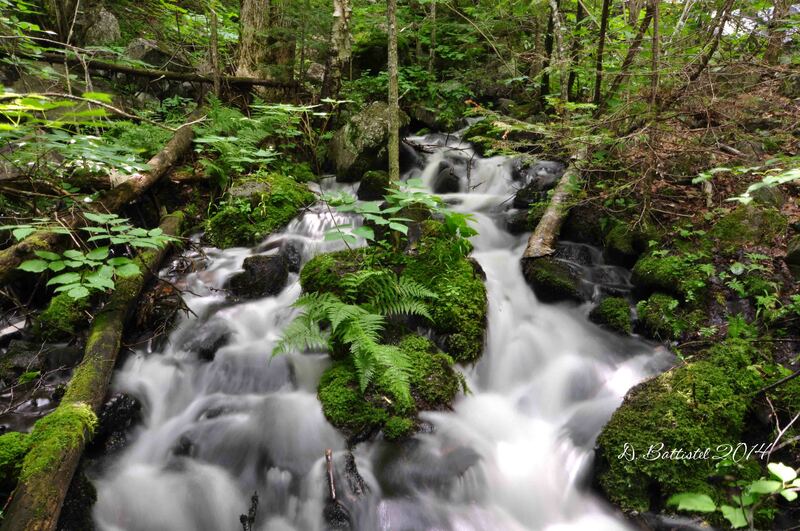 After arriving, I spent the afternoon walking along the Gunflint Narrows Road from the Cross River right up to the Narrows. It had rained earlier in the day, but thankfully it held off and let me accomplish all of my objectives. It wasn’t a super adventurous hike, but it was amazing to see some of the big rock cuts on the road. 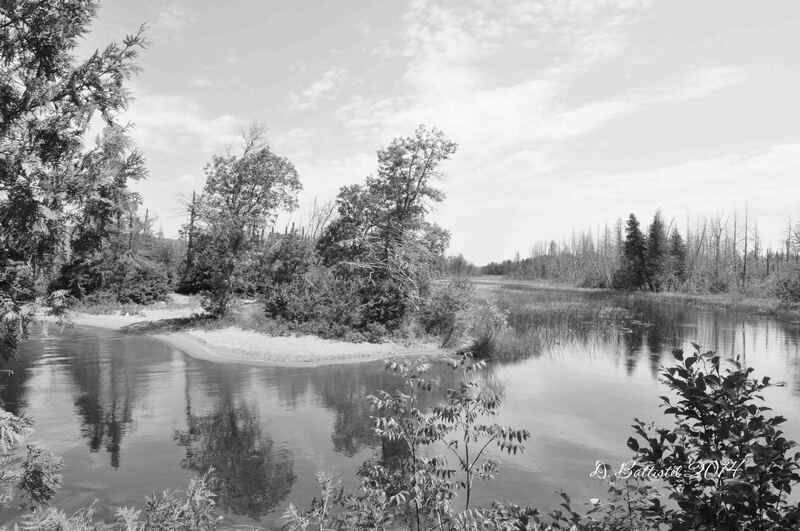 At the Cross River I could see a few traces of the trestle that once spanned the river. 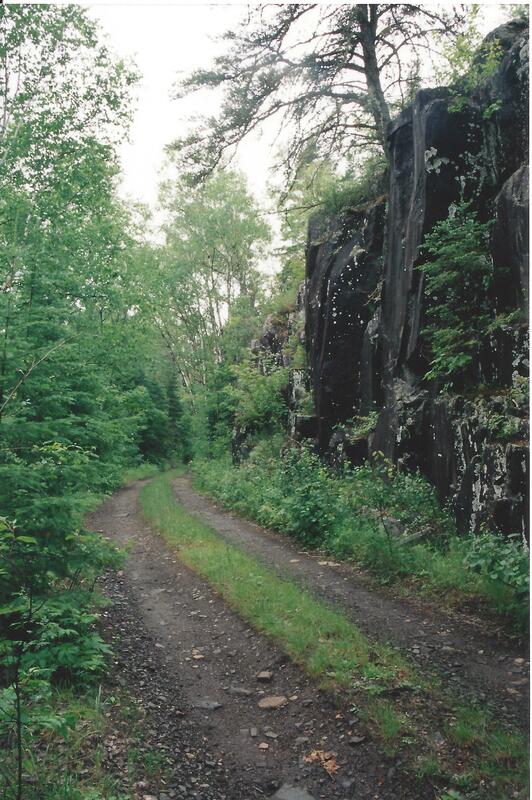 Gunflint Narrows Road, June 1998. The next day I headed over to the Round Lake Road to try and trace the railway as it passed through a switchback and made it’s way to the Paulson Mine. I initially had some difficultly finding the grade as it looped through a swamp (I would have the same problem years later) so I ended up searching for a rock cut that was supposed to be just beside the road. 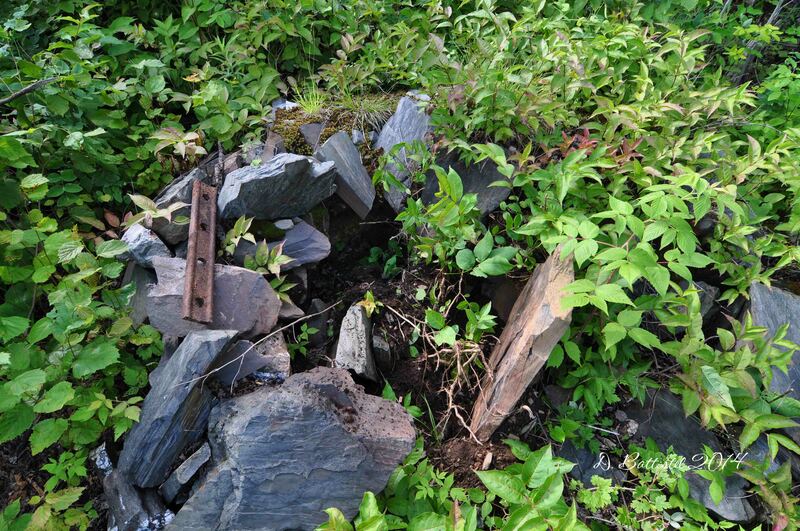 I did find it and followed it along to the location of the first of two trestles in the area, but I could not find the western side (in 2011 I would determine that there were in fact two rock cuts and two trestles, one slightly above the other). I picked up the grade a little farther west and could see the lower arm of the switchback under the forest canopy (my plan to follow it later in the day would be frustrated by rain). The railway took me along the north side of a ridge, through a number of small rock cuts until I reached a long rock embankment. 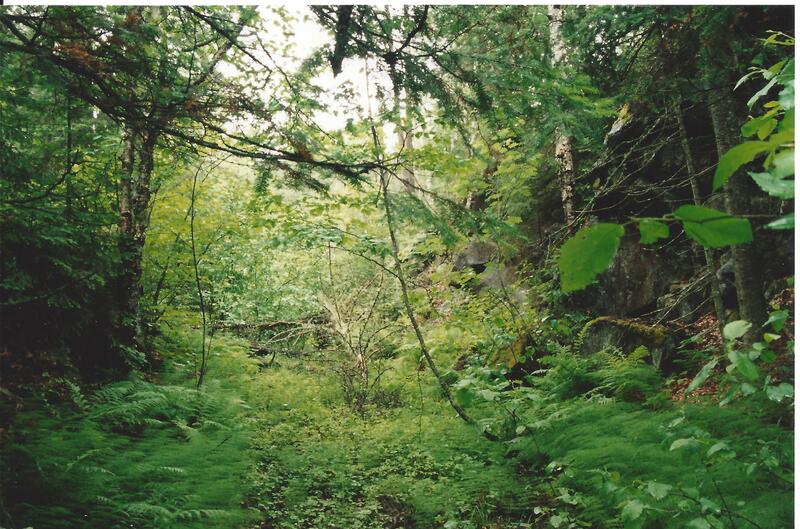 From there it was into a long, dark rock cut, which is now a big attraction on the Centennial Trail, but back then very grown in and difficult to navigate. 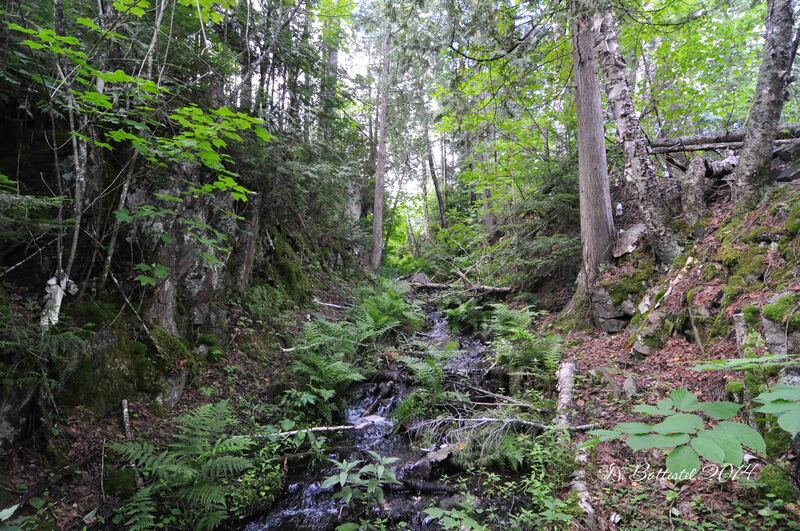 A short time later I reached the eastern side of a 400 foot trestle; unfortunately, owing to the very thick forest growth, I could not locate where the western side resumed. Today I know that it is blasted out of the side of the ridge but at the time I had no idea where to look. I had to head south to skirt the valley and at the same time try to locate the grade. I ended up on the top of the opposite ridge with the railway nowhere in sight; I actually got lost for a while try to figure out where I was. I eventually located the grade on the north side of the ridge and worked my west until I found a spot where there was a manageable descent. I planned on locating the western side of the trestle on my way back. As I headed west the weather took a turn and it began to drizzle; I’m not sure if you can picture what it was like, but hiking along this overgrown railway, soaking wet and tired was not a nice position to be in. A short time later I entered a long rock cut and was amazed to find ties still in their original location. After that I was along the north shore of a small lake, the grade barely above the waterline. 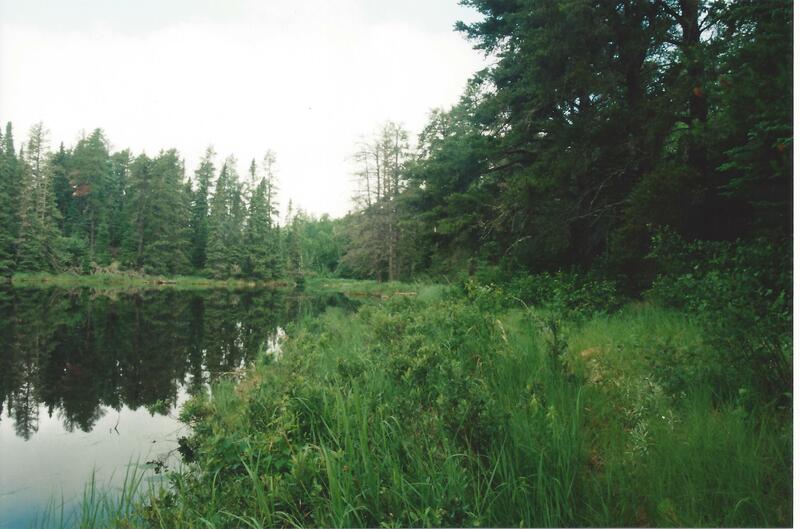 On the western shore of this lake was the site of Gunflint City, which was the camp for the mining operations in the area back in 1892-1893. After another 400 metres or so, I found my way blocked by a flooded rock cut, so I headed north and got on the Kekekabic Trail. 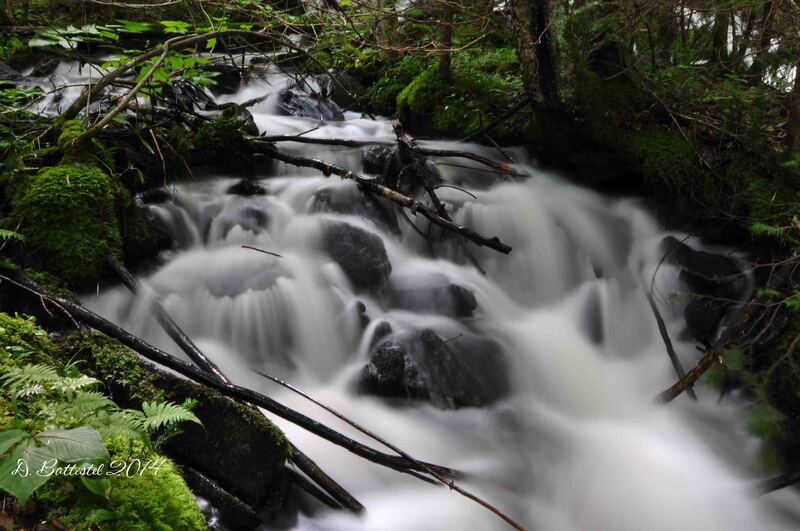 With the rail coming down and thunder booming in the distance (and also being completely drenched), I decided to call it a day and make my way back via the Kekekabic and the Gunflint Trail; the missing parts would have to wait for another time. Grade and Gunflint City, June 1998. After drying out back at the resort (the sun came out later in the day), I was back in the same area the next morning. 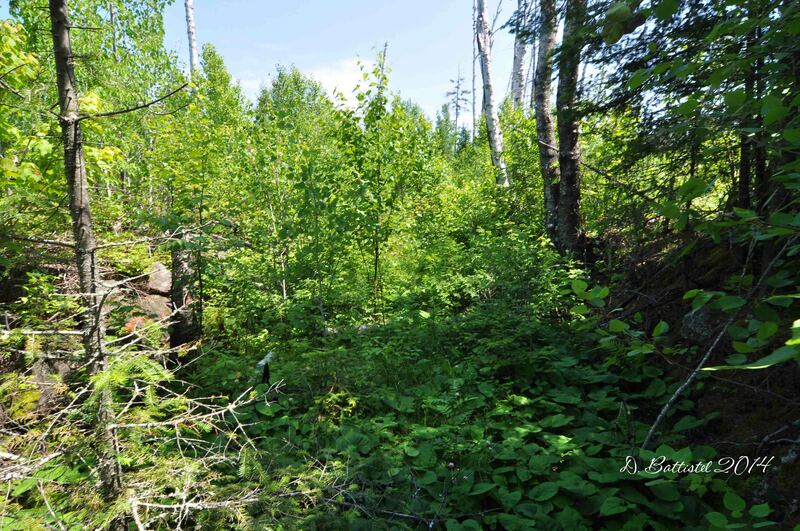 It was bright, sunny and warm and my plan was to explore some of the sites along the Kekekabic Trail, Gunflint City and hopefully locate the Paulson Mine. 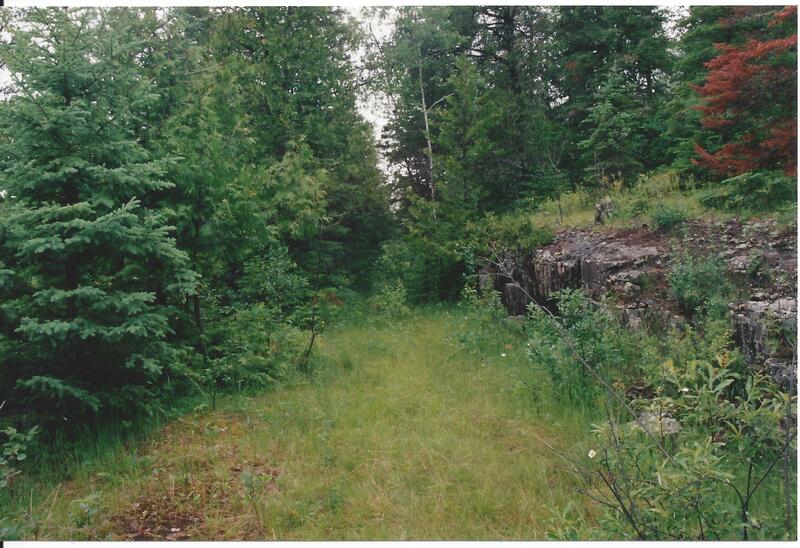 I made a quick stop at one of the test pits located alongside the trail (mislabelled as the Paulson Mine; now it is the third of five test pits in the area) and then headed toward Gunflint City. It would be a bit of a hike over the ridge between the trail and the mining camp, but I eventually made it. There I found some remains of the buildings that were at the site and it was interesting trying to envision what it would have looked like back in the 1890’s. From Gunflint City it was back over the ridge toward the Paulson Mine. Finding the shaft, I was a bit disappointed at the state it was in. Surrounded by a green snow fence, the opening was completely blocked by several trees that had fallen across the collar of the shaft, shielding my view of the inside. I was able to explore the site a bit, finding some pieces of machinery and seeing the piles of oxidizing tailings excavated from the shaft. Once I was back on the Kekekabic Trail, I headed west about 1.5 kilometres to Mine Lake (known historically as Akeley Lake). On the western side of the lake was a shaft that was sunk around the time as the other locations. 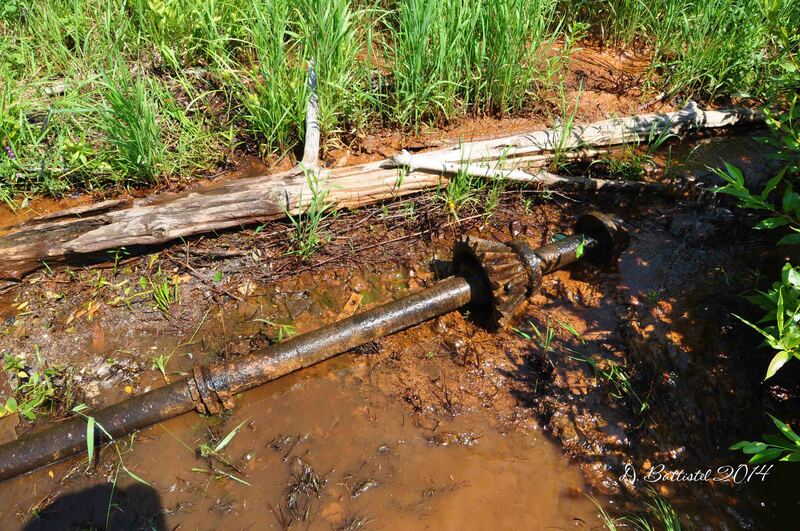 I found what would turn out to be the best preserved mine in the area (which has changed today-see my June 25 post) and a lot of machinery scattered around the site. All of my time for the day was used up by that point so I had to sadly head back to the resort. The last day of the trip was spent on the lake doing a little exploring and taking some pictures.